The film invites viewers to experience the world class features, design and capacity of Australia’s first fully-integrated convention, exhibition and entertainment destination, while showcasing the new venue’s integration with its immediate environment and surrounding precincts in the heart of Australia’s global city. Interviews with the NSW Premier, the Minister for Trade, Investment and Major Events and the Lord Mayor of Sydney within the film further underscore Sydney’s aligned approach in attracting business events to Australia’s premier harbour city. ICC Sydney CEO and AEG Ogden group convention centres director Geoff Donaghy said, “ICC Sydney’s smart, contemporary design doubles its capacity while allowing for multiple events to occur across the precinct simultaneously, increasing the area’s vibrancy while adding both large and informal meeting spaces to encourage collaboration and innovation. ICC Sydney’s ability to host three concurrent conventions, plus a large 8,000 seat theatre for major plenary and entertainment acts, 35,000sqm of internal exhibition space, a 5,000 square metre open air event deck that capitalises on the city’s temperate climate and stunning views, and the nation’s largest ballroom are just some of the features that are attracting business enquiries to the venue. 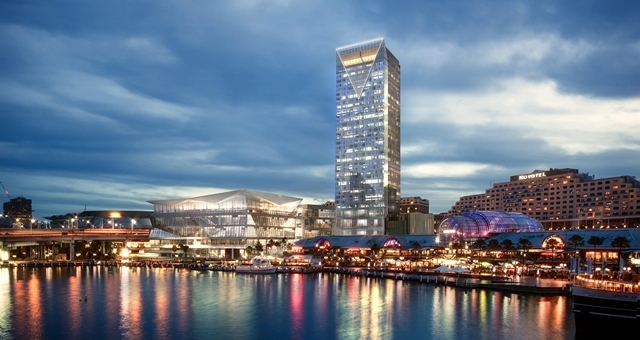 Donaghy said, “Located in the heart of the city, on one of the world’s most spectacular harbour fronts, ICC Sydney is closely connected to its surrounding precincts and communities. The premier venue’s physical connections are further enhanced by local academia, industry and government thought leaders. “ICC Sydney is firmly placed at the centre of Sydney’s robust financial, entrepreneur and knowledge economies. We are a short walk to Asia Pacific’s financial services hub to our north, institutions of learning and the highest number of start-up companies in Australia to our south, media and creative industry hubs to our west and the country’s largest CBD to our east. But it’s our people that really ensure that ICC Sydney is the city’s link between our visitor and knowledge economies,” Donaghy said. ICC Sydney has also recently launched its inaugural magazine. The magazine is designed to deliver news, information, tips and trends that will keep readers updated on ICC Sydney and how the venue will interact with the vibrant precincts around it. The post ICC Sydney’s IMEX push appeared first on Hotel Management. Previous ArticleAdventure stories – tell me yours, I’ll tell you mine!